... A few years ago, the American entrepreneur [Xavier Helgesen ...] traveling through Malawi stopped in Monkey Bay, a town of about 30,000 people, to spend the night. What made this place unforgettable, he says, was that it was "100 percent off-grid." The streets were pitch black. People carried kerosene lamps to walk around at night. When a family invited him to dinner, they all huddled under one dim light. "It was amazing," he says, "to see that was how everyone lived." 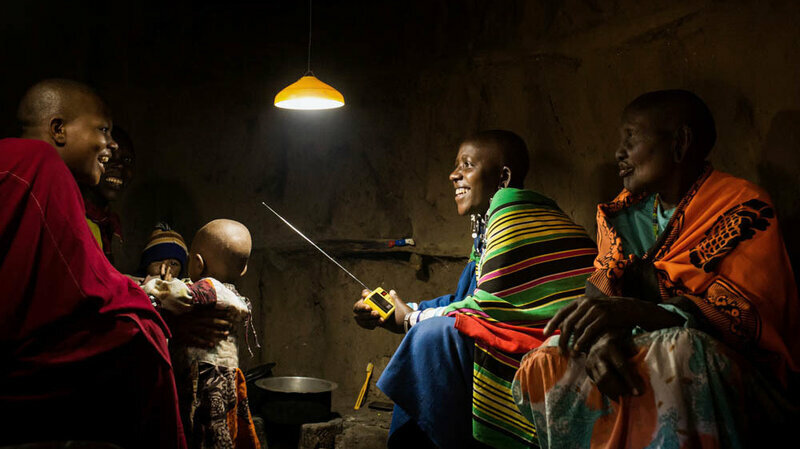 Helgesen ... today, is the head of Off-Grid Electric, a for-profit solar energy company that provides affordable electricity service for people in Africa who are off the grid. He started Off-Grid in 2012.... Off-Grid has reached more than 100,000 households and hired 800 of its 1,000 workers in Tanzania. This year, it's expanding to Rwanda. The goal to reach 1 million homes in Africa by 2017. In countries like Tanzania, citizens who lack power may have to wait years for the government to build up the grid and plug them in. And they'll pay for the privilege. By contrast, Off-Grid's customers can power up their homes for as little as $6 a month. When someone signs up for a system, there's a $6 fee for Off-Grid to install solar panels and a meter to monitor their energy usage, along with LED lights, a radio and a phone charger that all work off the solar charge. It only takes a few hours. Then customers pay about $6 a month to access the power they need — about what they'd be paying for kerosene for home energy. USAID is a big fan. Citing the group's "tremendous progress providing access to clean and reliable light and electricity," USAID launched a $36 million joint Power Africa and U.S. Global Development Lab effort [in June].... Off-Grid secured $45 million from stakeholders in December 2015 to expand the company. In January, it won the Zayed Future Energy Prize for its creative, "massively scalable" business model. Some solar companies tell potential customers, you'll be purchasing, say, 80 watts for your home. But it's confusing to sell electricity when you talk in watts, says Helgesen. Instead, Off-Grid reps talk about how many appliances in your home you can power....Off-Grid asks their customers which appliances they want to power up — then designs a package based on their specific needs. If they need to buy certain devices as well, like lights or a radio, Off-Grid can add those to the package, too. For many of Off-Grid's clients, their No. 1 wish is for electricity to run a phone charger. Customers might be intimidated by the idea of a monthly bill for 24/7 electricity, so Off-Grid customers pay for power as they use it, relying on mobile payment apps like M-Pesa. Many villagers displayed their new solar-powered light fixtures on their porch, leaving the inside of their homes dark. It was because they wanted others in the community to know they had electricity — a local status symbol. In June Off-Grid announced a new program called "Kazi na Zola," a collection of solar appliances like phone charging strips, entertainment systems and hair clippers designed to help rural entrepreneurs generate income.